Last summer, when I saw Grant Butler's recipe for wheat-berry salad in the Oregonian,_ I knew I'd like it. This my adaption of Butler's recipe, which makes a healthy meal-in-a-bowl — beans, grains, greens — and a fabulous brown-bag lunch. You can substitute canned garbanzo beans, but I like to cook a big pot of dried beans, then divide them into 2- and 3-cup portions to stow in my freezer for future meals (salad, roasted snacks, hummus, soup, curry, stew). Cook the spelt berries: Bring 3 cups of water to a boil in a medium saucepan. Add the spelt berries, return to a simmer, and cook about 1 hour (with a lid mostly covering the pot) until the berries are tender (still chewy but not squeaky). Drain and cool. 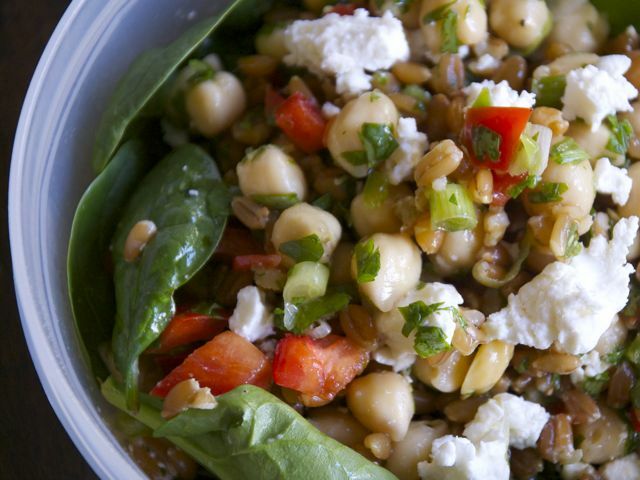 Assemble the salad: In a large bowl, combine the spelt berries, garbanzo beans, green onion, jalapeño, cilantro, and chopped red pepper. Set aside. Make the dressing: In a small bowl, whisk together the vinegar, lime juice, garlic, cumin, paprika, a big pinch of salt, and a grinding of black pepper. Whisk until the ingredients are blended, then add the oil, slowly, whisking all the while, until the dressing begins to emulsify and all the oil is incorporated. Season to taste with more salt and pepper. Chill the salad: Pour the dressing over the spelt-and-garbanzo mixture, tossing until all the ingredients are evenly coated with dressing. Cover the bowl and refrigerate for at least 2 hours to chill and allow the flavors to meld. Serve the salad: Stir the salad before serving to evenly redistribute the dressing. Serve over a bed of greens, topped with crumbled feta cheese.